She’s outspoken yet maintains a refreshing lemonade-out-of-lemons attitude. Free-spirited and grounded, intuitive and visionary, radically inclusive and a relentless voice for the academic side of the institution—this is Mary Ellen Finch, PhD, retiring vice president for academic affairs. Famously and gratefully looked upon as a retirement boomerang of sorts, Mary Ellen Finch has tried to retire three times over the past four decades but always found herself back in an academic role on account of her extraordinary leadership. She retired at the end of the 2017-2018 academic year, and she’s determined to make this one stick. It’s well-deserved and not unexpected—but still. She has touched the lives of thousands of students and helped prepare countless teachers to lead their own classrooms. Since arriving at Maryville in 1974 as chair of teacher education, Mary Ellen has served as dean of the School of Education, director of graduate studies, interim dean of the School of Health Professions (now the Walker College of Health Professions) and interim director of the physical therapy program. “Call me Mary Ellen,” she says on first introductions, dismissing formalities. She is also known fondly as MEF, as the heartfelt tributes attest. But she’s serious about the business of teaching and learning. Maryville’s Dr. Mary Ellen Finch Center for Teaching and Learning—providing resources and opportunities for faculty to study their own teaching more deeply—bears her visionary mark and her name. “We needed a place where faculty could learn and could share teaching ideas. What’s happened with the Center for Teaching and Learning is marvelous,” she says. Although she’s officially retired as of May 31, Mary Ellen won’t be completely untethered from her Maryville colleagues—and she’ll be in her element, serving as a part-time senior associate in the Finch Center for Teaching and Learning. 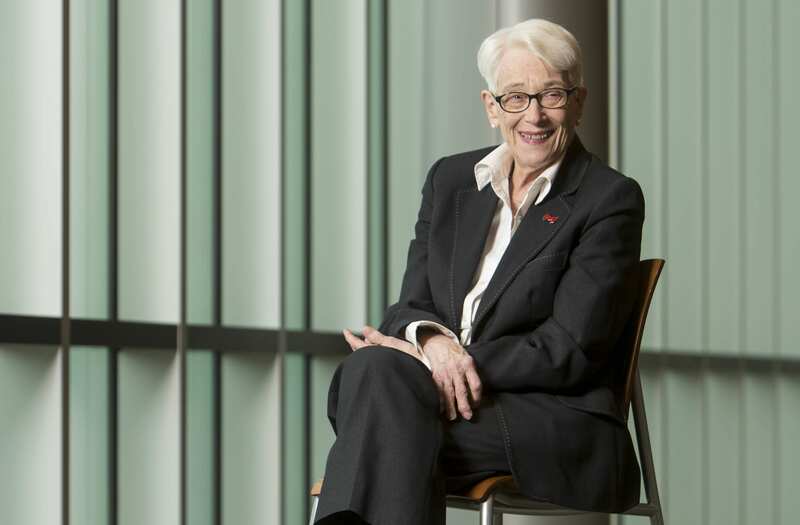 Over the years, Mary Ellen has been recognized for her leadership in higher education, including Maryville’s President’s Award for Strategic Excellence in Teaching and Mentoring. She has also been named a Woman of Achievement, served as a Fellow in Leadership St. Louis, and she received the Edward C. Pomeroy Award for Outstanding Contributions to Teacher Education from the American Association of Colleges for Teachers Education. I’m a teacher, first and foremost. When you’re a dean, the kids are still important but the faculty become your kids—they’re the ones you nurture and take care of. If our faculty appreciate me, I hope they appreciate me from the standpoint that I believe in them. Their work is so hard and my role—whether as a dean or vice president of academic affairs was to make that easier for them, to run intervention between those that get in their way and to get them as many resources as possible. Mary Ellen is known for hosting small book groups for faculty and staff. She chooses the book and participants sign up to join the discussion on a first-come, first-served basis. One thing I will be doing—and think I should be doing for the rest of my life—is leading book groups. Tears We Cannot Stop has been one of the most unusual experiences. The author, Michael Eric Dyson, takes out after we white liberals. There isn’t a thing in the book I disagree with. It hits hard. The discussions erupted, in a positive sense. I’ve never seen a group so willing to share. When I announced the next book group, within 10 minutes the book was sold out, and I had a waiting list. When I hire people, I point to Maryville’s strategic plan, which guides everything we do. And that very first theme, active learning ecosystem, that’s what it’s all about. It’s about working any way you can to engage students to think critically, to question, to dig deeper and to gather as much diverse information as possible. It’s not necessarily the use of technology, although that’s a great tool. But it’s using the best strategies you can think of, even if it’s to stand on your head—which it isn’t, obviously. Actively doesn’t mean physically active, necessarily, it means thinking actively. To really help students want to learn more, want to continue on—that is really hard work. I was teaching junior high school students and had just finished the Civil War and was going into a Reconstruction lesson. There was a fight between a black kid and a white kid in the boy’s bathroom, which was across the hall from my classroom, and good ol’ do-gooder, liberal, progressive Mary Ellen was convinced it was a race issue; it probably was not. So, I dropped everything and taught a civil rights unit, which actually turned out to be pretty damn good. One afternoon after school, my door flew open and a father came in and chewed me up royally, called me a communist; he just eviscerated me verbally. The next day I went back to school and the principal asked me, “Why didn’t you tell me what you were doing? I could have helped you and protected you.” It never occurred to me, I just did it. I learned something about administrators —that you can communicate with them. And I hope I’ve helped the kids coming up through our program by telling them, “Don’t do things in isolation. It has broader implications.” Many of those students as adults tell me they remember that unit. That’s what it’s all about. I can go to my deathbed thinking, “Well, maybe I helped those kids think more broadly about civil rights.” Those are things that make you think you’re in the right business. If you are a teacher, if you are fortunate, you have those experiences and it just makes teaching so worthwhile. I wanted to create a Center for Teaching and Learning so badly when I was dean. We needed a place where faculty could learn and could share teaching ideas. I would like it to be five times larger. Number two would be the School of Education. I have Harriet Switzer and Claude Pritchard to thank for that—past presidents who did not get in my way. They let me create and were supportive. They probably gritted their teeth a number of times, just like President Lombardi does. I had one of those special childhoods that creates confidence. I don’t remember—other than algebra—when I wasn’t encouraged or allowed to do my thing and encouraged to do it well. I was never really smacked down, except when I dated a guy my father really, really, really didn’t want me to and threatened not to send me to college if I didn’t end the relationship. But he had a convertible, and I was smitten! What would MEF tell current and future Maryville students? “Take a risk and go for the stars. Don’t be afraid, trust yourself but consult others. And always remember you are part of a larger community and your actions impact others.” Obviously, I’d love to use my platform to help students think about being civically engaged, etc., etc. but … ah, well.